Gehry’s Sunset Strip complex all clear to demolish Kurt Meyer-designed bank in L.A. In Los Angeles—when it comes to preservation battles and development, at least—history tends to repeat itself. Such was the case last week, as the Gehry Partners-designed 8150 Sunset complex cleared another legal hurdle in the quest to demolish an existing historic building so that the project might move one step closer to construction. The California Supreme Court refused to consider an appeal brought forth by the Los Angeles Conservancy against a recent ruling that would have allowed developers Townscape Partners to demolish the 1960s-era Lytton Savings bank designed by Los Angeles architect Kurt Meyer located on the project site. The bank itself was built following the destruction in 1959 of the storied Gardens of Allah hotel complex, an elaborate collection of villas surrounding the historic Hayvenhurst estate. In its time, the hotel hosted a who’s-who of Hollywood entertainers and literary personalities, including the likes of F. Scott Fitzgerald, the actress Alla Nazimova—after whom the complex was originally named—Greta Garbo, the Marx brothers, Ronald Reagan, and many others. Urban legend has it that the demolition of the Gardens complex inspired the line "they paved paradise and put up a parking lot" in the Joni Mitchell song "Big Yellow Taxi,” though sources—and Mitchell herself—do not quite agree on the matter. At the time of its destruction, the Gardens complex was seen as representative of an outdated style in need of renewal. Nearly 60 years later, Frank Gehry says the existing concrete folded plate structure that replaced the gardens has “outlived its time” as well, and is incompatible with his proposed design, a rumpled collection of twisted, fluted forms set to rise on what is now the city’s Sunset Strip. Gehry has pledged to “recognize” the Lytton structure as part of the redevelopment, though he has not specified what that means. The latest mixed-use project would bring a clump of segmented towers surrounded by broad public spaces and a stepped plaza to the site. Contained within the three squat towers that make up the project would be 229 housing units, including 38 low-income designated homes. The housing element will be joined by 60,000 square feet of commercial spaces, as well. It is unclear what’s next for the project. A statement from the L.A. Conservancy website states that the latest ruling “effectively ends legal efforts to stop the needless demolition of the historic Lytton Savings building,” however. A statement put out by Friends of Lytton Savings referred to the ruling as “bad news.” Steven Luftman and Keith Nakata of Friends of Lytton Savings said via email, “Demolishing the Lytton building will be a tremendous loss for Los Angeles. The building represents what was good about the ‘Mad Men’ era of architecture in Los Angeles: Kurt Meyer and Bart Lytton created a soaring space that brought art, sophistication and the vision of a bright future to the people of this city.’’ A development timeline for 8150 Sunset has not been released. A California judge has ruled in favor of Gehry Partners’s proposed 8150 Sunset development in Los Angeles, agreeing with the architects and developers Townscape Partners that preserving the historic Lytton Savings bank would make the project “infeasible." The decision comes nearly a year after a separate judge ruled against the project, arguing that the Googie-style, Kurt Meyer-designed bank was worth preserving. Gehry’s controversial project has faced a litany of complaints from the community since it was first announced in 2015, both from NIMBY-driven and preservation-focused groups. Initially, the project was tarred for being too tall, too dense, and for blocking views of the city from the adjacent Hollywood Hills. Next, preservation groups such as the Los Angeles Conservancy and Friends of Lytton Savings came out against the project for its proposed demolition of the historic bank. Following this initial dust-up, the 1960s-era Googie-style structure was swiftly landmarked, cited for its clean modernist aesthetic and its folded plate concrete roof. After last year’s ruling—precipitated by a suit from the L.A. Conservancy—it was hoped the bank could be saved and incorporated into the 229-unit mixed-use development. That opportunity has now disappeared. The Gehry project, as currently designed, consists of a cluster of five wobbly towers of various heights organized around a series of public outdoor spaces and ground floor retail. The development’s tallest tower is expected to rise up to 15 stories high. Hopes that 8150 Sunset would move toward final approval were dashed with the most recent ruling, however, which all but cleared the project’s forward movement. The ruling issued last week, according to the Los Angeles Times, stipulates that although the Kurt Meyer structure was not reason enough to stop the project, the project’s approval was incorrectly administered nonetheless. At issue is a proposed street vacation that would eliminate a right-turn lane bounding the project in favor of adding pedestrian sidewalk space to the project. Because the development is a private project, the judge ruled, closing off the right turn late equates with vacating a street, a measure that requires strict and separate approval. The court is sending the project back to the city so the lane closure can be properly approved. The debate over what is—and what is not—historically significant enough to save from demolition continues to heat up in Los Angeles, where a Los Angeles Superior Court Judge recently ruled in favor of the preservation of the historic Lytton Savings bank building. Townscape Partners, the developers behind the Gehry Associates–designed 8150 Sunset project, are seeking to demolish the midcentury modern structure so as to have a clean site for the controversial $300 million project. 8150 Sunset will consist of 60,000 square feet of commercial spaces and 249 housing units organized in a cluster of rumpled towers surrounded by plazas. The mixed-use development has received criticism from multiple fronts, including anti-density neighborhood advocates who see the project as incongruous with its surroundings. Detractors have also criticized the project’s parking stall count, saying the project has either too little or too much parking, depending on whom one asks. Preservationists—never to be left out of a good development fight—have waged a quest to save the historic bank building at the center of the recent ruling. The Friends of Lytton Savings group successfully nominated the structure for Historic-Cultural Monument (HCM) designation last year, but not before the Los Angeles City Council approved a development scheme for the project that presupposed the bank’s demolition. The Superior Court has determined that the city’s overall project approval was in violation of the California Environmental Quality Act (CEQA), a state law meant to defend both natural and built environments from harmful development. CEQA legislation is often used in California for historic preservation aims, especially with regards to culturally-important structures that might lack normative architectural significance. The decision with Lytton, however, was made easier because the project’s Environmental Impact Report (EIR) included two development alternatives that incorporated plans for repurposing the building, which was designed by architect Kurt Meyer in 1960. Under CEQA guidelines, historic structures must be incorporated into new developments if the project can still meet its fundamental objectives without demolition. As a result of the ruling, the City’s approval is being set aside and 8150 Sunset will have to either be re-approved to include preserving the historic structure or prove that keeping the structure intact would place an undue burden on the viability of the project. Of the various groups challenging the project, the L.A. Conservancy has perhaps has the firmest ground to stand on regarding their bid to positively impact the project's outcome. Sparing the Lytton building is a no-brainer, according to the Los Angeles Conservancy, as the structure is an important example of mid-20th-century design and has functioned for its original purpose—the building is currently home to a Chase branch bank—for its entire history. Moreover, according to the organization, the 20,000-square foot structure makes up a small percentage of the 330,000-square-foot project and could feasibly be incorporated into Gehry Partners’ plan for the site. Simply put, it’s unreasonable that the design and development teams should be able to clear a site of historic structures simply for convenience’s sake. In a statement announcing the Superior Court’s decision, Linda Dishman, president and CEO of the L.A. Conservancy said, “We’re very grateful for this decision, and we’re excited that the development project can move forward incorporating the historic Lytton Savings building.” Adrian Scott Fine, director of advocacy at the L.A. Conservancy added, “We’ve worked with many architects and developers to successfully integrate historic places into new development, and now that can happen here.” Scott Fine explained further: “blending old and new is the wave of the future in Los Angeles.” For now, Townscape Partners’ lawyers are evaluating whether to appeal the ruling. 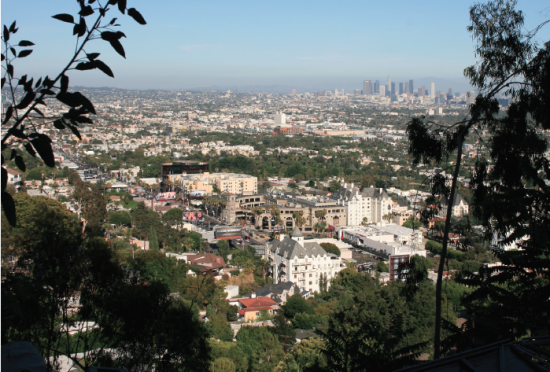 The Los Angeles Conservancy is suing the City of Los Angeles for “blatantly disregarding environmental law” and violating the California Environmental Quality Act (CEQA) by approving the Gehry Partners—designed 8150 Sunset development last month. The $300 million mixed-use project has faced community push-back from all sides, especially from wealthy neighbors who contested the project’s height, density, and parking provisions, even though the project is located on the Sunset Strip commercial corridor. Those partisans won out over the course of the approval process, as developers and even Frank Gehry himself, in an in-person testimonial before the Planning and Land Use Management Committee (PLUM), pledged to rework the project to ameliorate community concerns. At that meeting, the starchitect said, “I’m going to make it, as best I can, something special for the community. Something that we would all be proud of.” The development was ultimately approved by PLUM and, later on, the L.A. City Council, but with a few caveats. In a nod to the neighbors’ concerns, the project’s residential towers were approved with a 56-foot height reduction, an additional number of affordable housing units, and increased number of parking stalls. Overall, the project will contain 229 market rate units, including 38 affordable units, 65,000 square feet of commercial space, and 494 parking spaces in a group of rumpled towers located on a site featuring multiple public plazas and ground-floor retail. But one point the designers and developers behind the project would not flex on—and that neither PLUM nor the L.A. City Council were eager to emphasize—was whether to save the historic, modernist-style Lytton Savings bank building currently occupying a portion of the site from demolition. The iconic structure, which features a striking folded concrete roof and large expanses of glass, became a rallying point for preservationists who were not necessarily against the project, per se, but hoped the developers would incorporate the structure into the proposal. The bank building was designed in 1960 by Kurt Meyer and since plans were announced, a group of preservationists rallied around saving the structure. The structure was quickly nominated as a Historic Cultural Monument (HCM) status by Friends of Lytton Savings. HCM status offers some degree of protection against demolition, except that PLUM delayed the structure's nomination and the L.A. City Council was able to approve 8150 Sunset in the augmented form described above. The building’s existence is now in peril, and as a result, the Los Angeles Conservancy has filed suit to “force the City of Los Angeles’s compliance with (CEQA).” The Conservancy argues that under CEQA regulations, a project must “avoid significant impacts such as the demolition of a historical resource if the fundamental project objectives can be met without demolition.” The Conservancy’s logic stems from a series of development proposals incorporated into the Environmental Impact Report (found here) developed as part of the project’s approval process that called for reusing the structure as part of the commercial component of the Gehry Partners development (the building currently operates as a Chase Bank branch). Those alternatives, however, were shut out of consideration by the developers, who simply preferred to start with a blank site. Previously, Adrian Scott Fine, director of advocacy for the LA Conservancy, had told The Architect’s Newspaper that the Gehry project would “unnecessarily demolish a historic cultural monument,” and added, “there’s a very clear way for this project to move forward while preserving the bank building.” Friends of Lytton Savings founder Steven Luftman told The Architect's Newspaper via email that his group is "still proceeding with the Los Angeles Historic Cultural Monument (HCM) application with the full support of Councilmember David Ryu. The application goes to a vote with the LA City Council on Wednesday December 7th." When asked whether the group would support relocating the endangered structure as part of a comprehensive preservation approach, Luftman replied, "We continue to believe the best solution is for the building to remain at its current site. Incorporating this city's rich architectural past with the new project can lead to an exciting and vibrant development," adding "(Lytton Savings) functions beautifully as a bank and it has wonderful potential for adaptive reuse. Once the alternatives are appropriately explored, as a last resort we would consider a sincere commitment by the developer to relocate the building." For now, however, the Lytton Savings bank stands imperiled as part of a long line of Modernist structures falling to the wrecking ball and the project stands to move forward as approved. After much political wrangling and the promise of several key changes to the project, Gehry and Partners’ $300-million mixed-use project, 8150 Sunset, has been approved by the Los Angeles City Council, taking the controversial project one step closer toward beginning construction. Designs for 8150 Sunset, which was originally designed to add 249-units of market rate housing, 37 units of affordable housing, and 65,000 square feet of retail space to the Sunset Strip, were originally approved by the Los Angeles City Planning Commission back in August. The project features a cluster of five buildings grouped around public open spaces with commercial areas along the ground floor and a 15-story tower marking the northwestern corner of the site. The L.A. City Council’s approval comes a week after the project cleared the city’s Planning and Land Use Management Committee in a five-hour long meeting that included community input, as well as an in-person testimonial by architect Frank Gehry in support of the project. At that meeting, local Councilperson David Ryu dogged the project for its height, density, and paltry affordable housing component while also citing worries among community members that the project, as proposed, would badly increase traffic in the area. The meeting resulted in developers Townscape Partners agreeing to shorten the tower to 178-feet in height, increase the overall affordable housing allotment slightly, and provide an additional $2 million in funding for traffic mitigation measures. At the meeting, Ryu highlighted the project’s passage as the result of healthy compromise, stating, “8150 Sunset Blvd. is a much better project today” because of the agreed upon changes. Although developers Townscape Partners and the architect have wrestled with neighborhood and City Council opposition for months, the question of whether—and how—to save the historically significant Lytton Savings Bank building currently occupying the site is still an open question. Designed by Kurt Meyer in 1960, the late-modernist bank building is capped by a distinctive folded concrete roof plane and was recently approved as a city historic-cultural landmark in September. Back then, Adrian Scott-Fine, director of advocacy for the Los Angeles Conservancy, told The Architect’s Newspaper that the Gehry project—as presented—would “unnecessarily demolish a historic cultural monument,” adding “there's a very clear way for this project to move forward and preserve this bank building.” Consideration of the historic building’s future will be taken up by the City Council in November, when it will be decided whether to save the building or not and if so, whether to incorporate the structure into Gehry’s scheme or simply relocate the relic to a different site. What does Frank Gehry have planned for Los Angeles’ Sunset Strip? We've learned from Curbed LA that Frank Gehry is designing a large mixed-use development on LA's Sunset Strip called 8150 Sunset. Located on Sunset and Crescent Heights Boulevards, the project will be located on the site of an old estate nicknamed the "Garden of Allah." (The lot now contains a strip mall.) According to its Draft Environmental Impact Report (PDF), the new complex, consisting of two buildings sitting on a raised podium, will include 249 apartments, about 100,000 square feet of restaurant and retail space, and a large central plaza. Updated plans and renderings are set to be released this spring, according to developer Townscape Partners. A group called Save Sunset Boulevard is fighting to block the project, calling it a "hideous monstrosity," and attacking its EIR. Among other things the association, which is represented by anti-development lawyer Robert Silverstein, called out the project's potential to add to congestion, dwarf local historic buildings, block views, and waste water and other resources. The glitzy Sunset Strip has become an architect magnet, drawing Lorcan O'Herlihy and SOM (Sunset La Cienega), Ian Schrager, CIM, and several more. It's also been a graveyard of sorts, felling projects by Eric Owen Moss, Hodgetts + Fung, Kanner Architects, and others in recent years.